It’s hard to believe it’s been 10 years today since the ribbon cutting took place at the Hastings Skatepark on May 25th, 2001. Were you there? You can see in this photo that I shot of Sluggo on that opening day, there was barely any graffiti on the walls at all, she was still a new born babe. And, she’s standing the test of time, looking better than ever and that’s mainly because of that guy up there, Sluggo. He took it upon himself to paint the whole bowl a few weeks ago to make it killer smooth. Thanks a million for that Sluggo. There’s a very long list of others that need to be thanked for making Hastings a reality all those years ago, but you know who you are. Every time I think of Hastings, I think of Josh Evin, just one of the many, many rippers that have unlocked Hastings’ potential – just look at that air – RIP Josh. Photo taken from Louis Feller’s Flickr page. Do you have any pictures or videos from the Hastings Park? Put them up in our Facebook group gallery (or post the videos to our wall). I have a bunch of photos from the opening day on a disc somewhere… I’ll try to dig them out and put them up in the gallery sometime soon. Now get out there and carve a few lines in the bowl, and show it the respect it deserves. As part of BC Youth Week (May 1-7, 2011) – the Vancouver Skateboard Coalition, in conjunction with the City of Vancouver and Douglas Park, Thunderbird and Roundhouse Community Centres is putting on a youth-focused, family-friendly skateboard event Sunday, May 8th at the downtown Skate Plaza. Come down and enjoy a pressure-free day of fun down at the plaza – just remember to grab your pads, and especially your helmet. 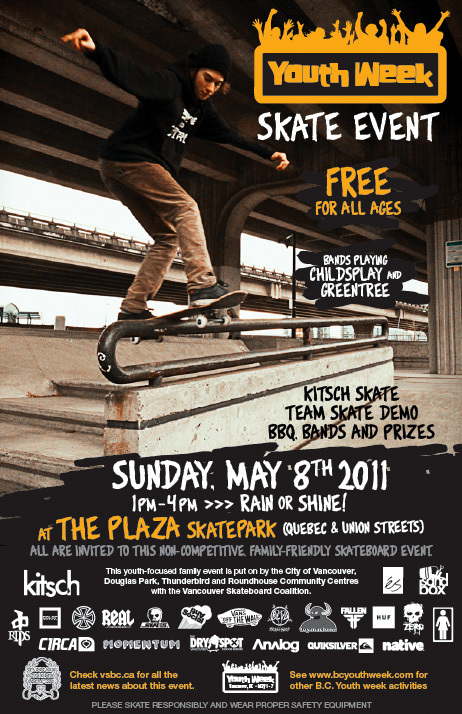 There’s going to be a demo by the Kitsch Skateboards team as well as a BBQ and bands. Child’s Play is back for the second year, and Greentree will also be hitting the stage. Be sure to check out their MySpace pages at www.myspace.com/thechildsplay and www.myspace.com/greentree. As this event gets larger every year, so has the list of sponsors – and that means more prizes for everybody! Tons of prizes from Kitsch, Monke, Color Magazine, Real skateboards, Skull Skates, Antisocial, Vans, Boulevard skate shop, Toy Machine, Fallen Footwear, HUF, Zero Skateboards, Circa, Momentum Wheel Co., the Dry Spot indoor skatepark, Analog, Quicksilver, Native shoes, Red Dragon Apparel, Independent Trucks, Girl Skateboards, éS Footwear, and Sandbox Helmets. Wow! Thanks a ton to all of our sponsors supporting this youth event – nobody will walk away empty-handed that day. The event is Sunday, May 8th from 1pm-4pm at the Downtown Skateboard Plaza (at Union and Quebec Streets), and is on RAIN OR SHINE. This is a youth-focused event, so all are invited to this non-competitive, family friendly skateboard event. We’ll probably have some Vancouver Park Board Commissioners and maybe a City Councillor or two come by to show their support for the youth of Vancouver at the plaza – and we hope to see you there too. For more info about youth week, check out there site at bcyouthweek.com. While we’ve got your attention: The Plaza will be temporarily shutting down for repairs after the Youth Week event, and will be closed for a few weeks while the park undergoes some much needed maintenance. 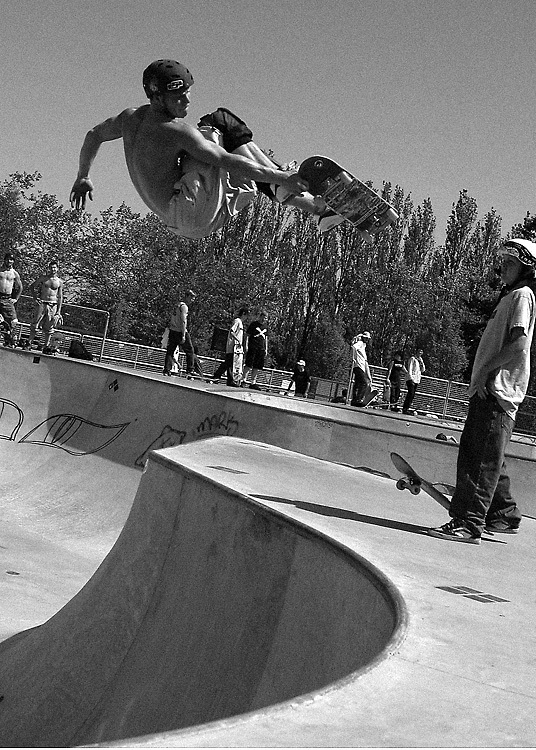 We’ve been told the park will definitely be reopened before Go Skateboarding Day, which is June 21st. We’ll keep you updated as we have any exact dates.